Good afternoon, colleagues, or more precisely, good evening. Mr. President, we received reports of an emergency situation in the Ust-Donetsky District of the Rostov Region on August 17. The situation was subsequently complicated by a big fire in Rostov-on-Don. We formed a large relief group quickly, which included the aircraft of the Emergencies Ministry, the Defense Ministry and the National Guard, as well as land forces. We have organized the operation of the emergency commission for the Rostov Region as well as of the heads of local governments. Losses in this dramatic situation were minimal, thanks to the energetic measures and prompt evacuation of the people. Emergencies Minister Vladimir Puchkov at the meeting on relief measures following fires in Rostov-on-Don and Volgograd Region. Vladimir Putin at the meeting on relief measures following fires in Rostov-on-Don and Volgograd Region. We have promptly organized temporary accommodation centers, and a special commission has analyzed the situation. The standards of relief assistance at these centers are very high in Rostov-on-Don. Similar centers were also established in the Volgograd Region, but it turned out that there was no need for them. 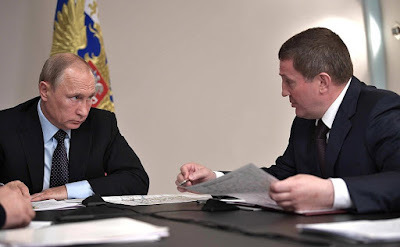 Russian President with Volgograd Region Governor Andrei Bocharov at the meeting on relief measures following fires in Rostov-on-Don and Volgograd Region. Rostov Region Governor Vasily Golubev at the meeting with President of Russia on relief measures following fires in Rostov-on-Don and Volgograd Region. 0 Comment to "Vladimir Putin held a meeting on relief measures following wildfires"